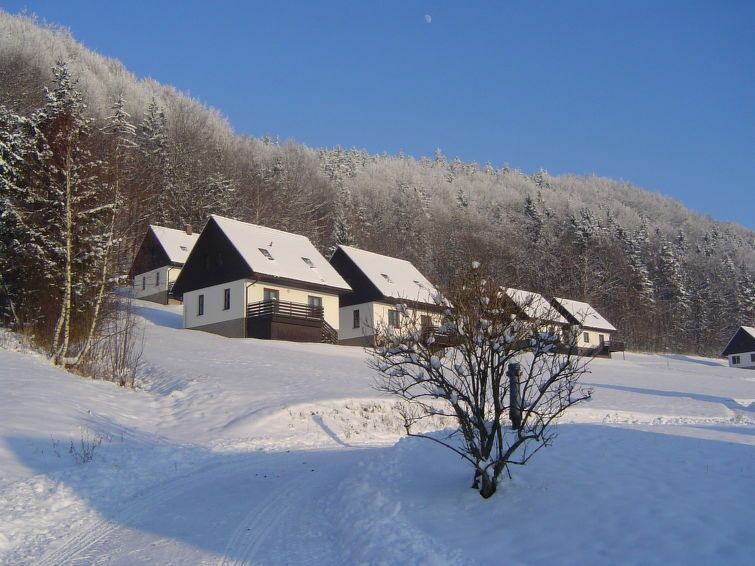 Stárkov 18 km from Náchod: Resort Stárkov, 2 storeys, built in 1997, surrounded by meadows. On the outskirts, in a sunny, elevated position on a slope, along the wooded area, in the countryside. For shared use: meadow, pond, swimming pool (8 x 4 m, depth 150 cm, 15.06.-31.08.). Table tennis, volleyball, badminton, volleyball court, beach volleyball, patio, barbecue, fireplace, children's playground (slide, swing, sandbox). In the complex: reception, lounge, massage (extra). Billiard table, playroom, table football, trampoline, kiosk, storage room for bicycles, laundry (extra), bicycle rental. Linen change (suppl. charge extra). Towel change (suppl. charge extra). Room cleaning on request (extra). Bread roll service possible on request. Pre-arrival grocery service. Motor access to 200 m from the house. Central parking spaces. Grocery 1 km, supermarket 8 km, restaurant 1 km, café 10 m, bus stop Stárkov, mlékárna 100 m, railway station Hronov 8 km, outdoor swimming pool 10 km, indoor swimming pool 18 km. Golf course 19 km, sailing school 26 km, tennis 1 km, minigolf, riding stable 10 m, walking paths from the house, cycle lane 100 m, ski lift 10 km, slopes 10 km, ski school 17 km, cross country ski track 100 m, ice field 8 km, children's playground 10 m. Nearby attractions: Adršpašsko-teplické skály 15 km, Broumovské stěny 15 km, Náchod 18 km, Ratibořice a Babiččino údolí 22 km, Broumov 23 km, Relaxpark Pec pod Sněžkou 50 km. Well-known lakes can easily be reached: vodní nádrž Rozkoš 26 km. Please note: suitable for families, baby equipment on request (included). The photograph shows a typical example. All houses/apartments are individually designed/furnished.